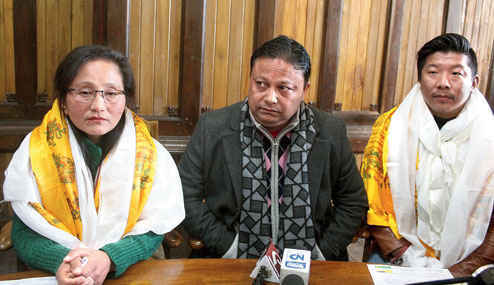 Darjeeling/Siliguri: The Binay Tamang camp of the Gorkha Janmukti Morcha on Wednesday named Prativa Rai and Sagar Tamang for the posts of chairperson and vice-chairperson of Darjeeling municipality, respectively. The current chairman, D.K. Pradhan, had been arrested during the Gorkhaland agitation last year and is in jail now. Ramjung Golay was the vice-chairman and had resigned from the post as well as the councillorship. The names of Rai and Tamang, the councillors of wards 23 and 25, were announced by Anit Thapa, the second most important leader of the Morcha's Binay camp. "They are our choices for the posts of chairperson and vice-chairperson. We will also take necessary steps to see they assume their offices," said Thapa. The Binay lobby of the Morcha had already grabbed power in Kalimpong and Kurseong municipalities. Of 31 wards in Darjeeling, 28 are with the Binay camp. In October, the councillors of the Binay camp had written to the administration, saying the board was unable to discharge duties in a "desired manner" and demanding Pradhan's removal. "But the tenure of Pradhan as the chairman had not crossed the six-month period for a no-trust motion to be moved against him. The six-month period ended in November and it seems that is why the Tamang camp has come forward to remove Pradhan," said a political analyst. The Binay Tamang camp of the Gorkha Janmukti Morcha on Wednesday named Prativa Rai and Sagar Tamang for the posts of chairperson and vice-chairperson of Darjeeling municipality, respectively.